The following article was first published by The Seen in December 2018. Currently on view at Monique Meloche Gallery is new work by Ebony G. Patterson, …for those who bear/bare witness…, a solo show that explores the slip between human visibility and invisibility within our societal and material conditions. Patterson’s primary tool is aesthetic: intricately layering textiles and garden imagery, she creates a sensual environment of visual stimulation to call forth the specter of social injustice. Undermining the white cube paradigm, Patterson covers gallery walls with a repeated image of a wilting bouquets at night. These momento mori are lush with rich, velvet shadows and soft highlights that together create a stage for the rest of her installation. While providing an allegory about mortality, the ubiquity of the repeated motif makes each dead bouquet individually unexceptional except by their overwhelming accumulation. Upon this backdrop, a suite of ten ornate and individual textile compositions stand out against the wall like plants. These works blur the lines between painting, photography, sculpture, and collage, emphasizing the artworks’ materiality. Patterson combines found textiles, bespoke tapestry, beadwork, and thrifted objects like a bejeweled hummingbird broach, Styrofoam chickens, glass pearls, gold coins, fake flowers, plastic adhesive google eyes, gold painted nautilus shells, or dime store watches. Knit together, these baroque layers simultaneously conceal, reveal, and contextualize human figures. 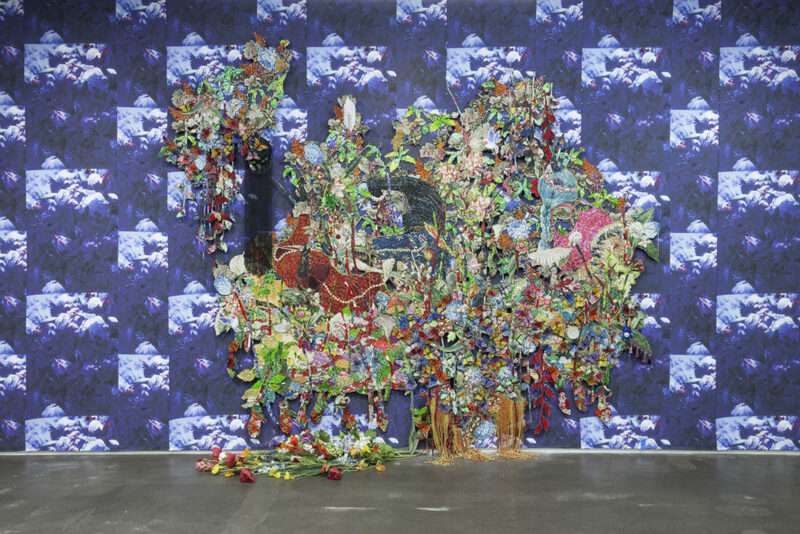 Sometimes called a “maximalist,”1 Patterson is best known for these lush multi-textural installation collages of fabric, clothing, and sometimes mannequins. Working with digitally sourced imagery of murdered, anonymous, and often young black men, Patterson resists the impulse to reproduce those images directly in the final installations. Instead, she works with models to restage the found photos in her studio. The models wear prepared outfits—in this case, ornate, historic-looking costumes that almost recall Elizabethan dress. This element of translation and reenactment is significant both because it avoids reproducing and aesthetizing violence against the black body under duress. Whereas Kerry James Marshall adeptly subverts this historic tendency in Heirlooms and Accessories (2002), a tryptich that highlights white women attending a lynching, Dana Schutz aggravates the matter with her tone deaf and by-now infamous painting of Emmit Till. But beyond those counterpoints, by reenacting (rather than reproducing) the virtual photographs, Patterson calls attention to how a collective consciousness of violence against anonymous citizens is taken on by others within society. These rememberers, or mourners, assume the role of the dead, honoring a memory and bringing absence back to life. This translation is further complicated when Patterson sends her studio photographs to industrial tapestry makers, who subsequently reproduce her studio images in tapestry form. As such, she reintegrates these studio performances into the network of mass-produced material manufacturing, re-embodying absented bodies from virtual into material spaces through available channels that, like the dimestore broaches, fake pearls, plastic butterflies et al are produced by typically underpaid laborers. This final turn seems particularly important, especially as it connects to the garden, the figure under duress, and the haute couture of the commercial market. Whereas colonial practice financed Westerners to travel to exotic parts of the world, collect (often botanical) life forms, and bring them home to national and personal gardens or menageries, Patterson compares the individual plant to the art object. Viewers are invited to purchase these decadent and glittering pictures of dark societal conditions, to bring them back to a home or a museum. In so doing, the artist highlights how collectors and art trends are complicit with post-colonial power. Furthermore, and because of her use of mass-produced decorations, she implicates the more general consumer as well. Each of us purchasing items that furnish our everyday lives—from cotton socks to fake flowers to cell phones to sea food—are bound up in global economic forces that serve a few while cutting off many from the opportunities needed to subsist. Nevertheless, there is life and play and energy in this show. Something staunch and defiant, a determined joy despite the constraint of damning conditions. This feeling is infectious. Here too, the plant metaphors are apt. Vines are self-determined, the insist upon growing, enduring despite (and beyond) the gardener’s most earnest attempts to control and shape. Indeed, it is the organic but highly considered accumulation of these elements that gives the work its power. …for those who bear/bare witness… runs at Monique Meloche Gallery until January 12, 2019.